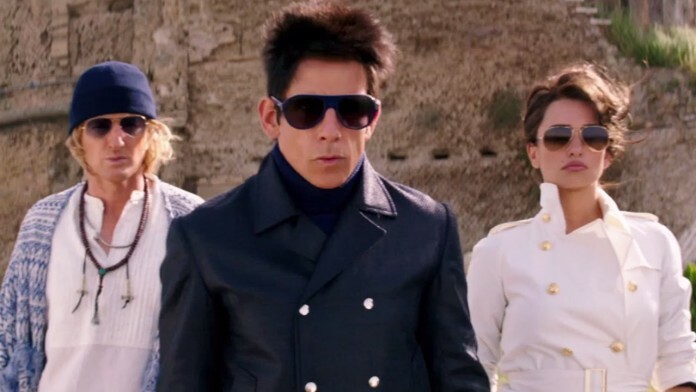 When you begin your movie with a scene featuring Justin Bieber being chased by masked assassins, only to then be cornered outside Sting’s house, and ‘taken out’ in an overstated fashion, it’s fair to assume that things can only head downhill from thereon – and in the case of Ben Stiller’s Zoolander 2 – the sequel to the cult favourite comedy that was released 15 years ago, that’s very much the case, in what can only be described as a superfluous addition to a franchise which didn’t need adding to. Across the past 15 years, former supermodel Derek Zoolander (Stiller) has been cast aside, living remotely following a tragic disaster which killed his wife, and eventually lost him custody of his only son, Derek Jr. (Cyrus Arnold). However when offered the chance to model for the new kid on the block (Kyle Mooney), thanks to a message hand-delivered by Billy Zane, Derek returns to the world he left behind, incensed on being a father to his son once more. Joined by Hansel (Owen Wilson) who leaves behind a pregnant Keifer Sutherland (don’t ask), he joins his old friend on his mission, which also attracts the interest of agent Valentina (Penelope Cruz) who believes Derek Jr. is the latest target for the nefarious antagonist Mugatu (Will Ferrell). This sequel makes up for its distinct lack of jokes by implementing a convoluted narrative, where big set pieces are prevalent, and we deviate carelessly from the character’s idiosyncrasies, which is what provides the biggest laughs. Be it Derek’s immense stupidity, or the hilarious accent and make-up of Kristen Wiig’s Alexanya Atoz – we veer away from such jokes, in turn for grandiosity and complexity in the storyline. This is indicative of a film devoid of originality, seeking cheap laughs from obvious places, such as the persistent cameo performances. Similarly to the Anchorman sequel, it works almost as a diversion technique, as though distracting us from the lack of jokes and material, hoping that a game of ‘spot the famous person’ will suffice in its place, keeping us entertained in a rather easy fashion. The film is, of course, absurd and ridiculous, but while in the preceding endeavour that worked as something of an attraction, in this picture it’s all too contrived in its execution, with surreal jokes implemented without a real context, just there to shock us. This is another disguise for a film without many truly hilarious jokes, and the sign of a filmmaker hanging on to the coat-tails of the last film, which is still considered a cult favourite – but that almost happened by accident, this is vying for such status too patently, too self-conscious and aware of what worked, which has backfired tremendously. That said, it is fun how we explore the hipster revolution and this new guerrilla approach to the fashion industry, taking over the more traditionalist aspects of the vocation, in a similar vein to how The Incredible Burt Wonderstone managed, except that focused in on the world of magic. As a result, Zoolander 2 hinges on the notion of relevance, and whether Derek and Hansel have a place in a contemporary landscape, where the modelling world has changed significantly. On this showing, however, it’s hard to tell if they genuinely do.